Click on any of the labels or icons for detailed information. Sanam Chan Palace was built by King Rama VI. Construction began around 1907 when he was still Crown Prince. The plan of the complex, drawn up by the Oxford educated Prince, was almost a complete departure from traditional Thai palaces, and strongly resembles a modern suburban development. The Crown Prince, by some accounts, considered himself a true English gentleman and wanted an English style country residence. The complex includes several 'cottages' around the park-like setting, but the main royal residences are grouped around a circular drive on an island in the center of the park. One of the cottages surrounding the island is the Tab Kaeow residence, which was briefly used by the crown prince while the first main buildings were under construction. The first buildings of the palace itself were a group anchored by the Phiman Pathom Residence. This was later connected to the Vajariromaya Residence, which was built after the coronation of the crown prince. The small Chali Mongkhon Asana residence was also built after the king's coronation, while the traditional Thai styled house, the Tab Khwan Mansion, was built as the headquarters of the king's Wild Tigers Corps. After the king's death and the 1932 revolution ending the absolute monarch, the palace building were used by the provincial administration. Part of the grounds were given over for a new campus of Silpakorn University, Thailand's main arts university. In 2003 the university returned the main palace buildings to the royal household to be restored and opened to the public. King Rama VI also built Phayathai Palace in Bangkok, which like Sanam Chan palace resembles a European country mansion. Admission to the palace is 50 Baht (1.30 USD). Be sure to keep your admission ticket handy, as you will need to show it to gain entrance to each of the buildings. Getting there: The Sanam Palace is due west of the Phra Pathom Chedi. If you visit the chedi, leave by the west gate and walk down the road leading away from the gate (Ratchadamnoen Road). You will come to a traffic circle with a fountain in the middle spinning a big marble ball. At the traffic circle, veer left and take the road that follows the canal, keeping the water on your right. You'll come to an entry gate and ticket booth a short way up this road. 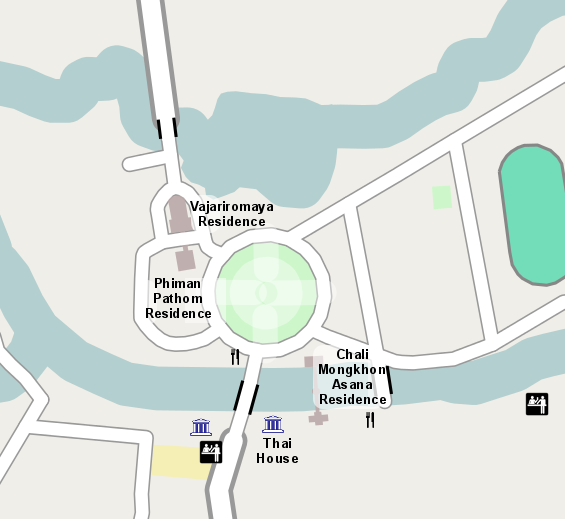 See the Nakhon Pathom city map for more information.